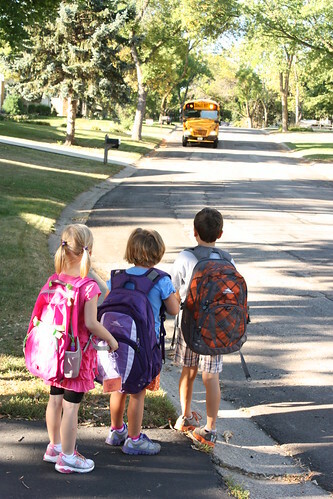 school | Blog, Jane! Blog! We’ve been “Back to school” for a week now. And it was a good week! Maria loves her new school. We are so glad we sent her to the school age program this summer, because she knew so many kids before she even started. (and at Sunday School too!) When we asked what she liked about her new school, she says she likes that they have a school song! Charlie is in the same classroom that he started in this summer and with the same teachers but most of the students changed rooms, so it’s kind of new to him too! 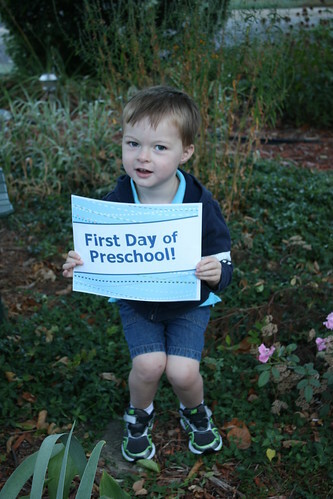 Looking forward to a great school year! Glad it is off to a good start! Here we go again! 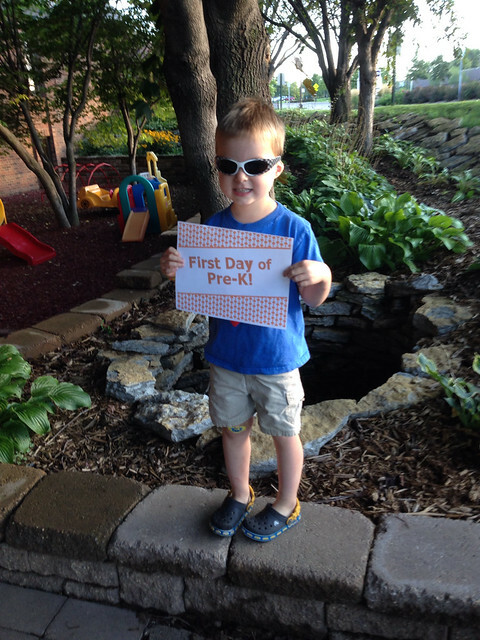 More milestones – of the first day of school type! 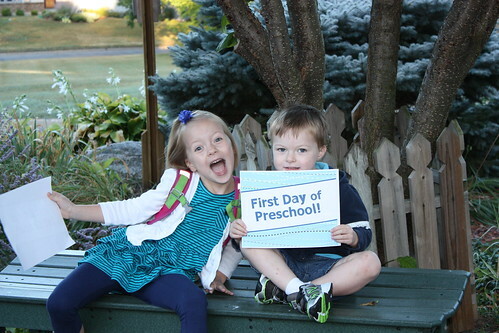 Charlie had his first day of preschool today and Maria her first day of First Grade. Both had great days. Both were tired tonight – Especially Charlie! But his teachers said he just went with the flow and it wasn’t like he was the new kid at all. Of course, it helps that they all know him as Maria’s little brother! Maria declared the new girl in her class her new Best Friend in the car ride home from after school care. 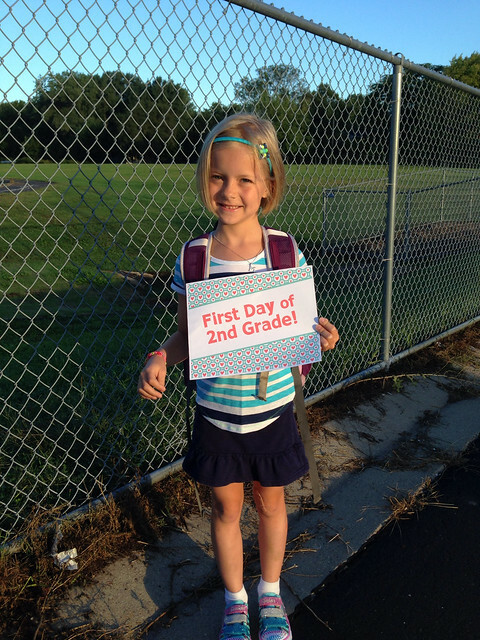 Which is good, considering her Kindergarten BFF is at a different school this year. And she came home with homework (1/2 page of numbers). She has also been asked to read 20 minutes a day. So we set up a little table in her room, where she can work without Charlie and I showed her how to set the timer to make sure she gets 20 minutes in. All in all, based on the first day. I think it’s going to be a good year! Maria is loving school. And I know that Kindergarten is sooo very different than when I attended Kindergarten 30+ years ago, but wow, some of the stuff she tells me is very interesting. This week she has learned what I would refer to as “soft” skills. How about that for melting a Mom’s heart?? 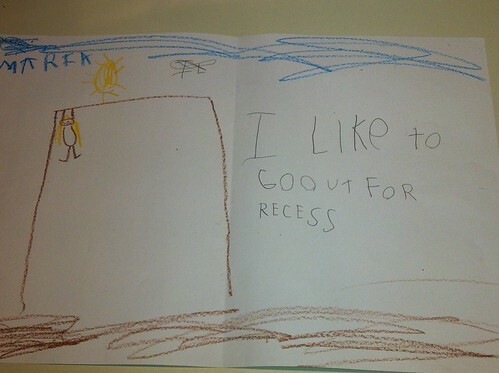 Maria is obsessed with monkey bars, so naturally recess is her favorite time of day at school. I must say though she was pretty excited to have learned about the 5 senses in Science class today too! 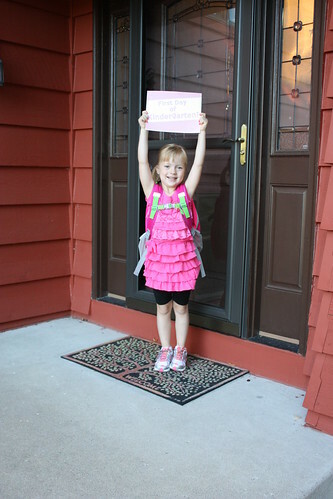 Maria is officially a Kindergartener! 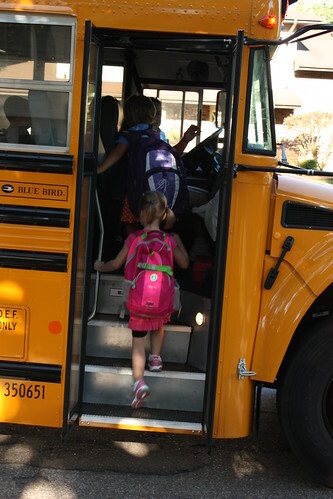 She got on the bus today and rode off to school. Chad and I both took her to the bust stop, which is by our daycare provider. And once she was on, we were left wondering all day what she was doing! When she got off the bus this afternoon, she was excited to see me and Charlie waiting for her. She said the teachers were waiting for the Kindergarteners (they started 2 days after the rest of the school) and had them all line up. Maria made some new friends and some others that she knew that are in other classes. She had a peanut butter and jelly sandwich for lunch, because she thought the tacos would be too “hot”. She had gym class and music class. Tomorrow they have science class. She was tired. I could tell that. Tonight tucking her in, she expressed some disappointment that they spent a lot of time “learning” and not much time “playing”. She is hoping that next week when her teacher is back (she is out sick and they have a substitute), there will be more playing. 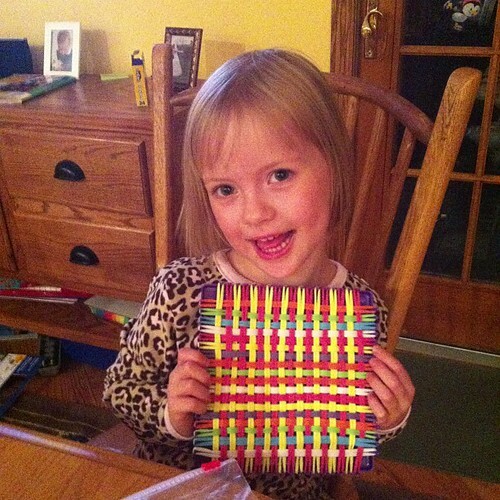 In order to keep her calm for bed, I just answered “maybe…”. I think she is looking forward to Day #2, but I’m not convinced this transition will be super easy for my little over-thinker. (She may get that from me!) But all in all, a good first day for all of us! 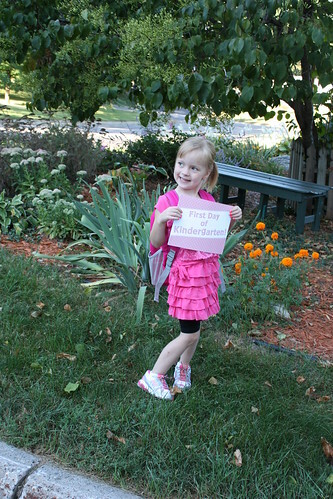 And she’s off to Kindergarten! Summer. It’s busy. Nothing terribly exciting, but still lots of fun things going on too. Right now our focus is on school. 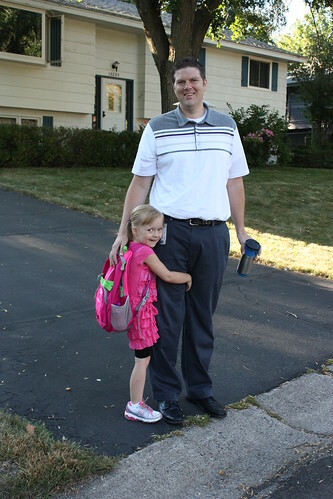 Maria starts school next Thursday. Last week I started getting a little nervous about it. I’m not sure why. She is so ready for this next chapter. She will do great. I think I’m most nervous for the transition. I’m a fan of routine. I think my kids are too. Maria especially. Transitions are hard for her. 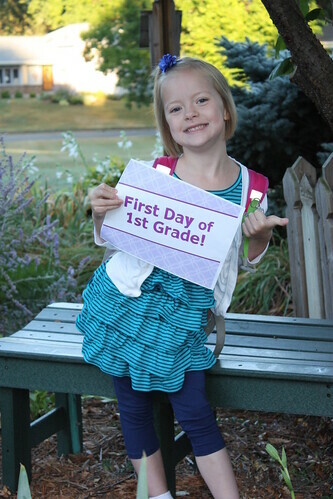 Last year she had a tough time when she didn’t even switch preschools, but she had new classmates and some went off to Kindergarten. It was tough. 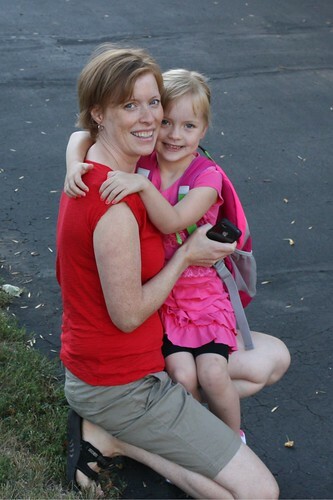 Tomorrow is her last day of preschool, and it is going to be tough to say goodbye to her teachers and the staff there.